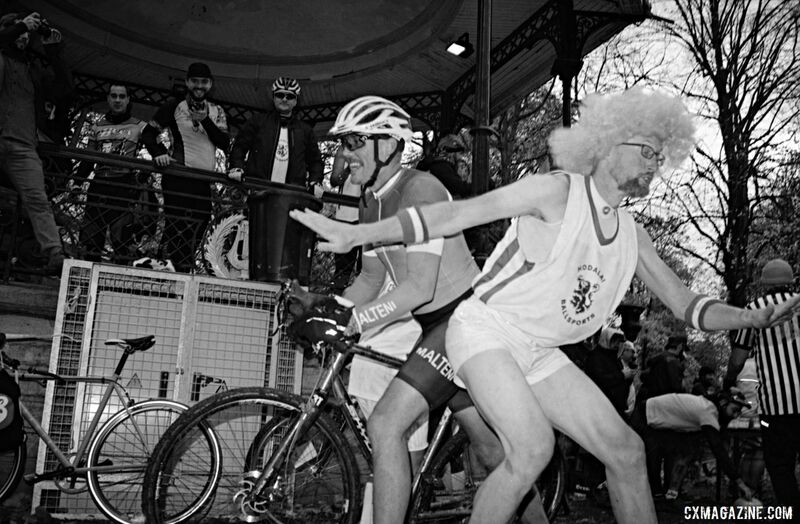 A weekend in November, the city of Tournai, Belgium hosted the first Single Speed Cyclocross World Championships held in the Motherland of Cyclocross. The weekend celebrated friendship, beer, singlespeed cyclocross and lots of rain. Two race days covered the qualifiers and the semifinals, this year adding the Junkyard race to the mix on Friday night for extra urban assault style racing. Saturday morning, fans of riding, hanging out and kicking knobby tires past the start line and down a hillside tore up fields at a small farm 30 minutes outside Tournai. This race was the annual Gogo Hellcross, held since 2013, remembers a fellow single speeder Gogo who is no longer with us. The race is also a fundraiser for brain cancer research. At the le-Mans-inspired start, race staff deliberately tangle the bikes sometimes remove front wheels and send them rolling away from the starting area to ensure maximum confusion and a level playing field across the rider board. At a designated checkpoint, riders must down a beer or empty the glass into their hair. The circuit—which is marked by tape and progresses in and around trees and bushes, through farm buildings and muddy trenches—can alter during the race, as bystanders decide to make swift action and edit the course and landscape to better accommodate particularly interesting rider action. 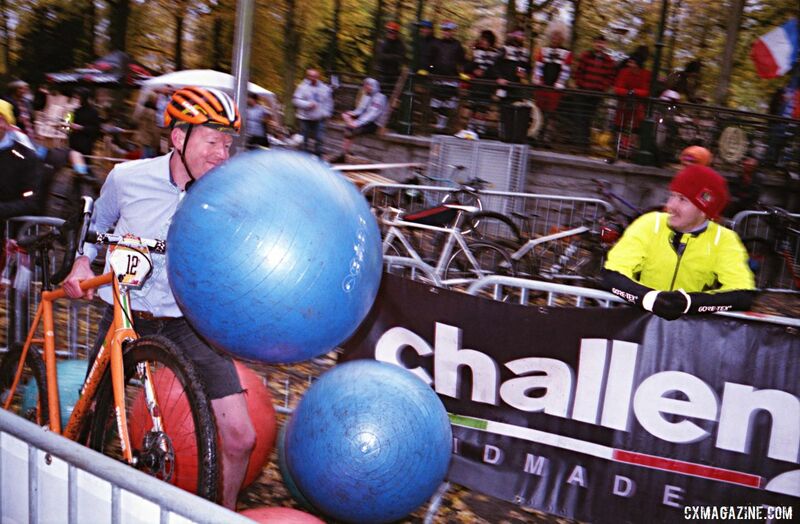 Adding rock barriers to the course or making participants dismount bikes and run through a caravan, while the bike travels over the caravan, aided by the hands of race staff and bystanders. 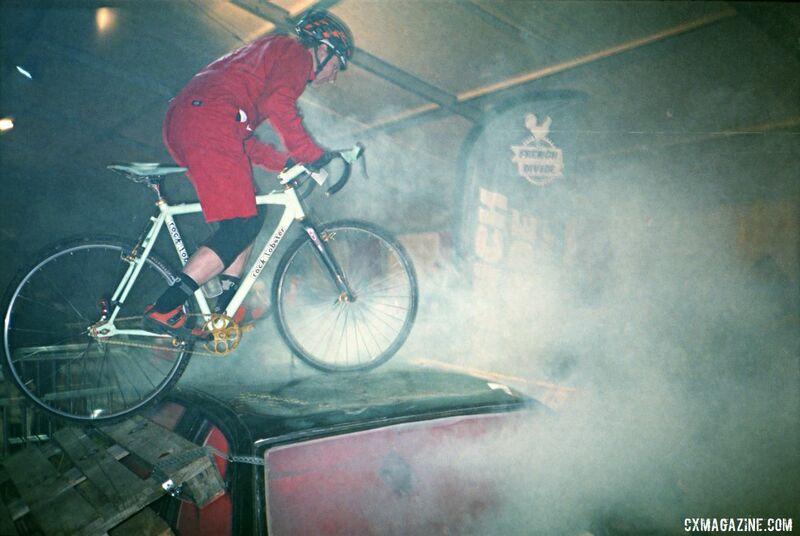 In a barn located in the middle of the course, gold sprints meet beer drinking on two specially devised and welded together bikes which gradually pour beer down the riders’ throats as they pedal each other. In the background, elderly people from the local community serve sandwiches and pour beer for the onlookers. According to the nonexistent rulebook everyone qualified for the semifinals that are held the next day in a central city park next to a local landmark site. The social event, which awards a tattoo to the winner, is first and foremost about spending time together while dressed up. The course layout is partially improvised on the day and for this event features a smoke tunnel, a yoga ball pit, an american basketball crew and a beer stop, serving locally brewed and bottled brew. At the end of the day, a winner is found and everyone is a close second. But as participants say, it was never about the racing and accordingly, people show up from around Europe and North America mostly to enjoy the companionship of finishing second. For more from the weekend, see the photo gallery below. The 2019 Urban Cyclocross Zürich traded fields for an urban park with sand, a pool and a van. Find out who came out on top of the eliminator format race.